The Volkswagen Group’s most bonkers and opulent division is hoping that their Bugatti Chiron hypercar can surpass the status of the legendary Veyron. While we won’t know the full performance potential of the Chiron until someone tests it, a look inside the factory that builds these amazing machines reveals an incredible attention to detail. The factory is over 10,764 square feet and the floor is made from an epoxy that repels electrostatic charges. There are no robots in the factory, but rather 12 stations where each assembly group works like a Formula 1 team. It takes over 1,800 individual parts to assemble a Chiron. The Chiron’s 8.0-liter W16 weighs 1,384 pounds, about the same as the Veyron’s motor even though the new engine makes an additional 300 horsepower. 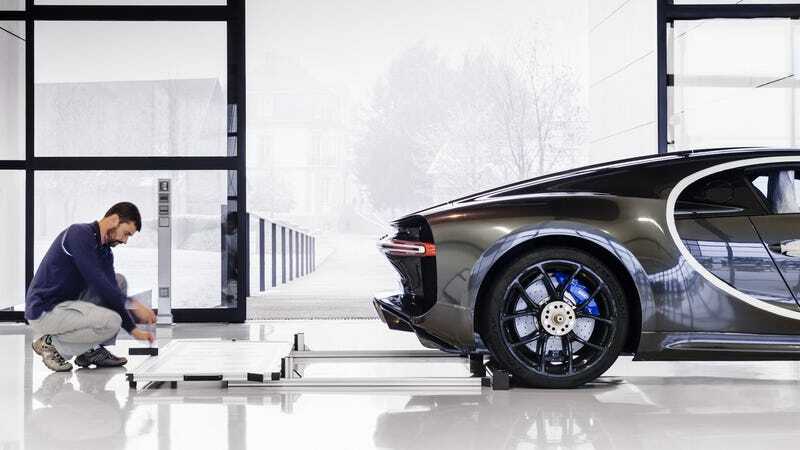 In order to test the Chiron’s 1,500 horsepower and 1,180 lb-ft of torque engine, Bugatti installed the most powerful dynamometer in the world. When the Chiron is tested, it produces 1,200 amps of electricity that is fed back into the power grid. For the exterior, there are 23 topcoat colors and eight carbon versions to choose from. Up to eight layers of paint may be required depending on the customer preferences. Each layer is painted by hand. The interior is available in 31 different colors for the leather or eight Alcantara upholstery colors.There are 30 different stitching options, 18 various types of carpets, and 11 seat belt colors. Of course, Bugatti will custom match the interior to whatever you like. It takes about six months to produce and deliver a Chiron and only 70 units will be made per year. The car is assembled by just 20 employees. Also involved is a team of 17 logistics personnel and 15 quality assurance specialists. The Chiron experiences monsoon like rain conditions for 30 minutes to check for water leaks. Each Chiron is road tested on the Autobahn at 155 MPH. They also say the factory is so clean and spotless you could eat caviar off the floor. I’m happy to nominate some of my coworkers to test this claim in person.